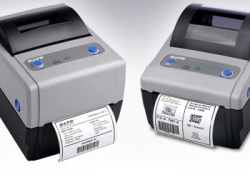 RighterTrack blogs and posts our thermal printer field service calls, in order to help others troubleshoot their label printing issues. My first field visit this year was to a long term, 15+ year customer outside of NYC. The customer stated that the thermal transfer ribbon was breaking. When I arrived I saw that this particular Sato CL408 printer was approximately 15 years old. I examined the path of the label stock through the printer, and that was fine—no stuck labels or adhesive. The next possible culprit to confirm was the ribbon take up spindle tension. A simple loosening of the thermal transfer ribbon take up spindle’s tension, and some tweaks during test label prints solved the issue. All I needed to do was loosen the lock nut on the spindle, loosen the nut a tad then re-tighten the lock nut. During the test print, I also noticed that the overall print was “snowy” and that a small portion of print was missing in the print head test pattern. Since the misprint occurred in the exact same area on the labels, further inspection confirmed that the rubber platen roller was worn had been nicked. Due to the age of the now discontinued printer, the customer has been advised to prepare for a new printer purchase. The platen roller issue will not affect bar code reading, and I was able to increase the print head’s overall pressure to compensate for the worn platen—this of course is a short term fix. For the time being, I will continue to add new field visits and the solutions pertaining to the thermal printers. As always, let me know how this site, or I can be of assistance to you.